This weekend I tried variations on lemon cake (with lemon curd, lemon buttercream, and vanilla buttercream fillings). I also tested out how a cake looks with only buttercream covering the outside, rather than fondant (not nearly as good), and whether or not painting with white coloring on colored icing works (it does). As has been the case so far, a mixed bag of positives, but a good deal learned. 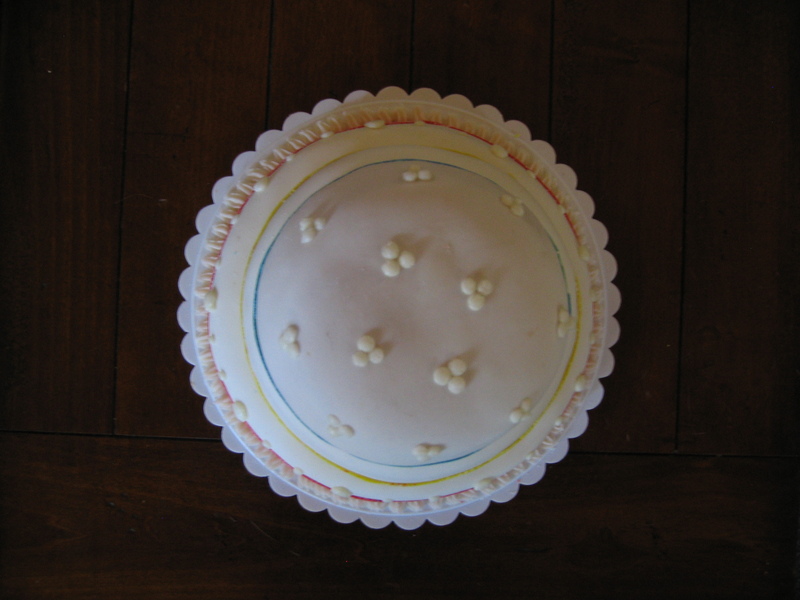 The separator plates are necessary, even with a cake as small as this (the bottom layer is 8″ in diameter). 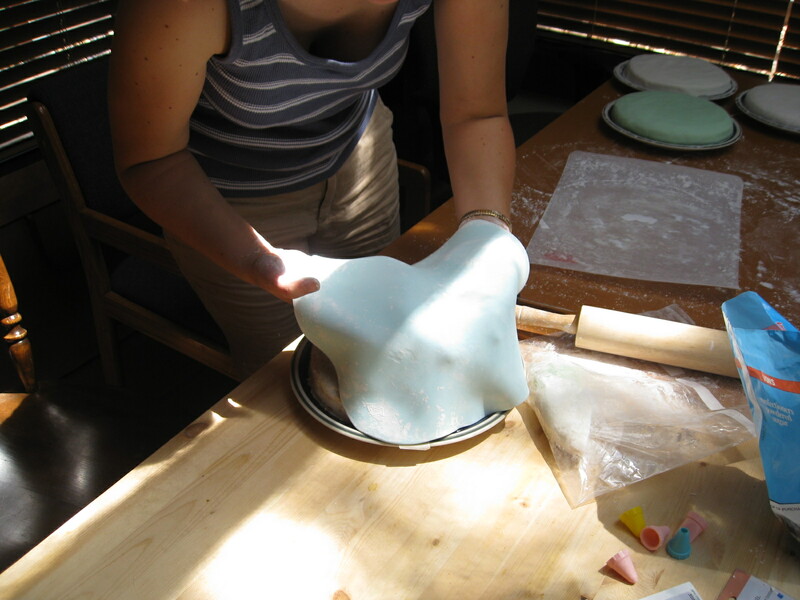 Buttercream alone cannot be gotten smooth, and looks much less polished than fondant. I definitely prefer the fondant look. 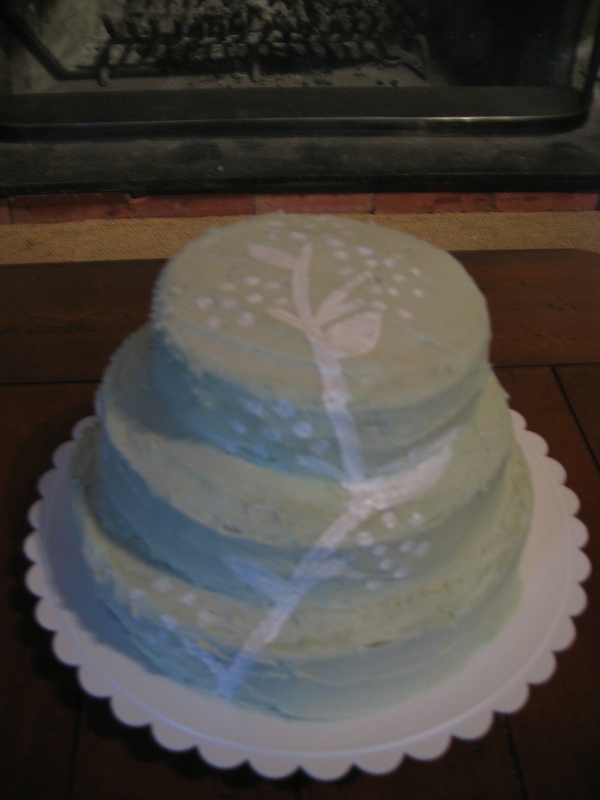 I like the look of the “paint” on the cake, though I’d need to really think about the design and background color. I like lemon cake, or at least lemon flavor as part of the cake. It’ll be a layer for sure. I also got a cake leveler tool after the domed ridiculousness I experienced last time. It made a huge difference and the cake is a lot more even overall, though I still need to be more careful about leveling the icing layers or I’ll still end up with a lopsided cake. The white food paste is very opaque and shows up well, even against a very pale background. I do like how the green color came out (a drop of leaf-green and about a quarter drop of burgundy to make a pale sage green). 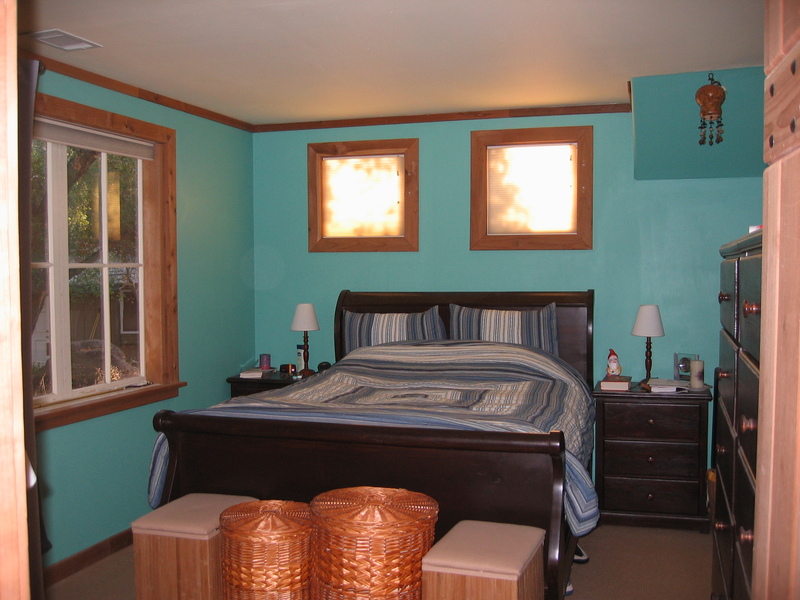 The painted design was totally freehand and not planned well at all. I think it could look pretty nice with a little thought. I also saw a really interesting for technique for doing a combination of painting and piping on Ace of Cakes this week that I’ll have to try. That’ll be next time! Matt is already getting sick of cake, and I don’t really like it to begin with. We need more people to take it around here! Yesterday I made my first three-tiered cake as the next major step in my wedding cake trials. 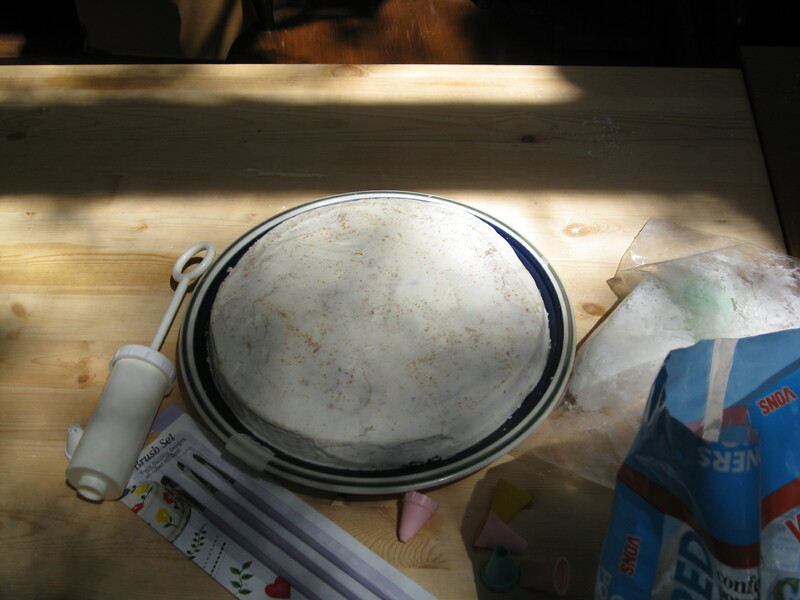 I started baking the cake at 11 am, and had finished all assembly and decorating by 3:30 pm. Not to shabby! I also prepared and ate lunch, read a few chapters my book, and did the dishes in the middle of that time, so I could have even done it faster. All in all, a successful experiment! 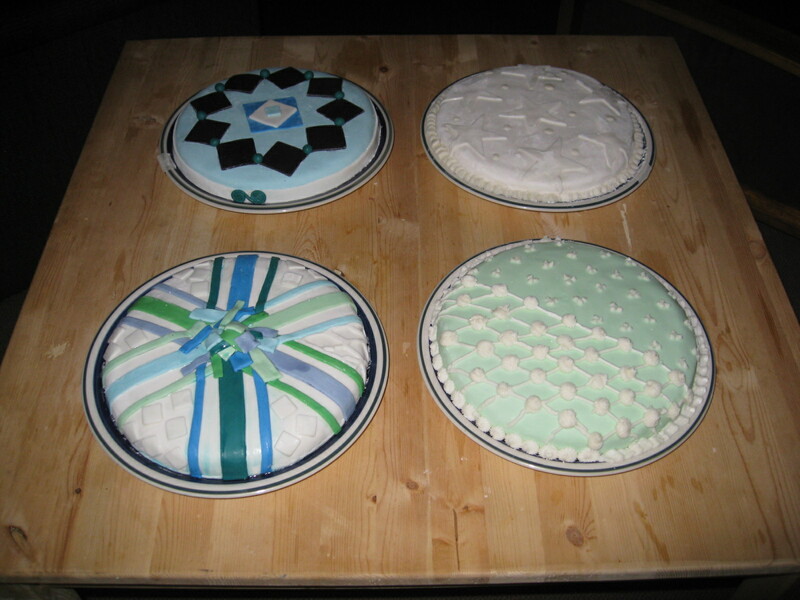 I used wooden skewers for the bracing between the stiff cake plates underneath each layer. I got a set of reuseable plastic cake separator plates on eBay so that I can make as many cakes as I like without having to use up lots of cardboard cake plates. 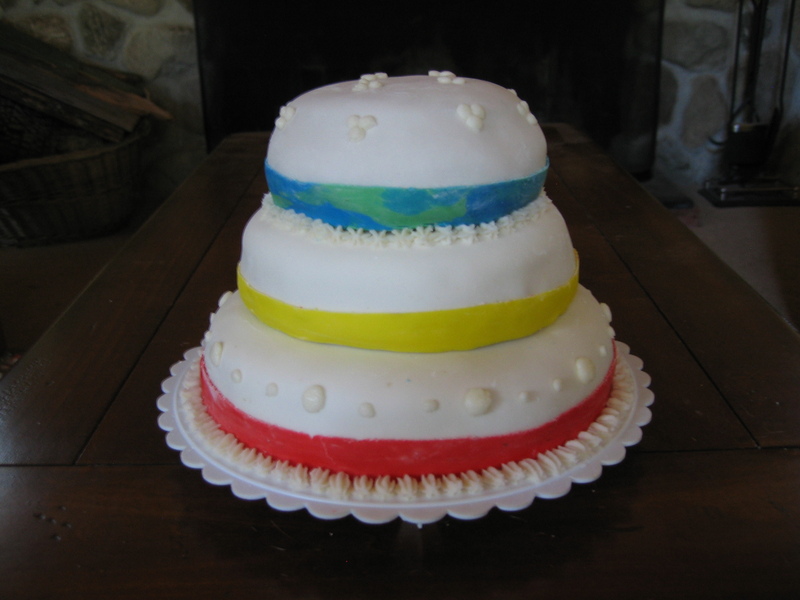 I don’t love the way that the colored bands look, and they were very difficult to do with the length of continuous fondant “ribbon” needed to cover the circumferance of the circles. I can’t imagine doing it with cakes the have double the diameter, so I’m going to ditch that idea for the fnal product. I definitely like the simplicity of the frosting decorations on this, and I’ll probably keep working on this style as I make more. I also did multiple fillings in the layers. It’s chocolate cake, with plain buttercream, almond-chocolate buttercream, and strawberry filling. It’s time to start ruling out flavor combinations! I discovered that the cakes baked in these particular pans come out really domed, so I’ll need to get a cake leveler to make sure they don’t end up as rounded as this again. I’m not a fan of the rounded top and edges. Alright, folks. 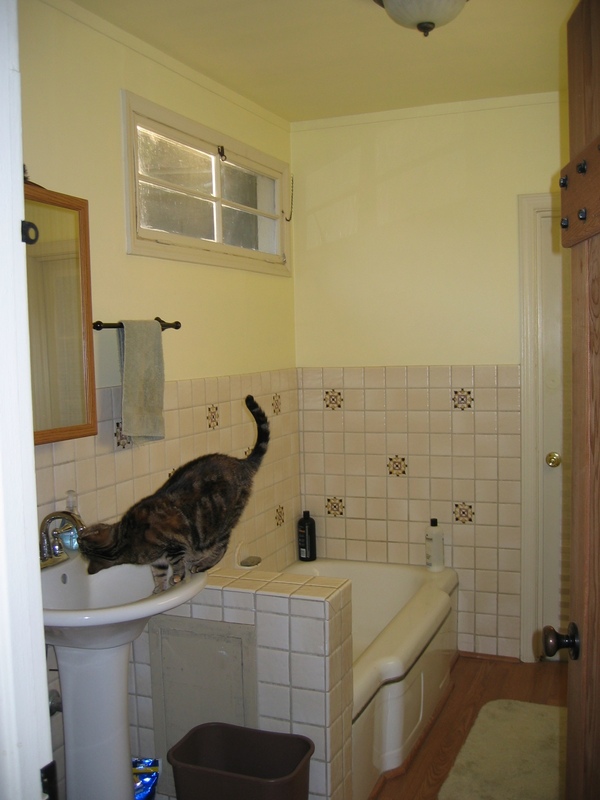 I finally took pictures of our place as it looks currently and am posting them for your viewing pleasure. Enjoy! Could I possibly make my own wedding cake? I have officially determined that paying a ton of money for a mediocre-tasting, beautifully decorated cake is ridiculous. I am going to make my own wedding cake. Others will help, too, but it could be a one-person job pretty easily. Before you claim that I’m crazy, let me show, in evidence, the cakes that we (a mother-in-law-to-be, two friends and I; with no bakers or cake decorators in the bunch) made yesterday. All of the cakes were gorgeous, and were almost ludicrously easy. I expect to be able to do it, but that we would have some major troubles or mistakes, but everything went smoothly, and all parts of the process were extremely forgiving. The hard part will be making the decisions about what to actually do for the cake (# of tiers, colors, decoration style/method, cake flavors, etc…). 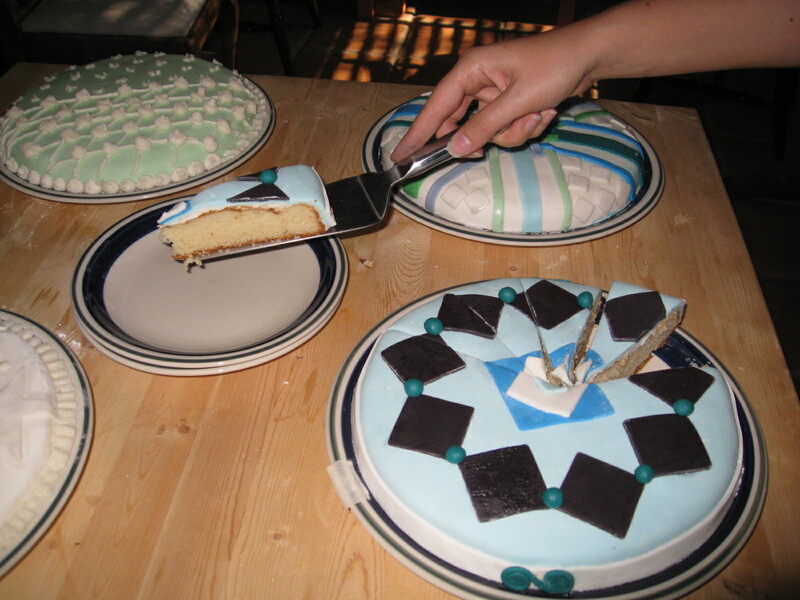 Now I know that the actual decoration of that cake is achievable, no matter what I pick. 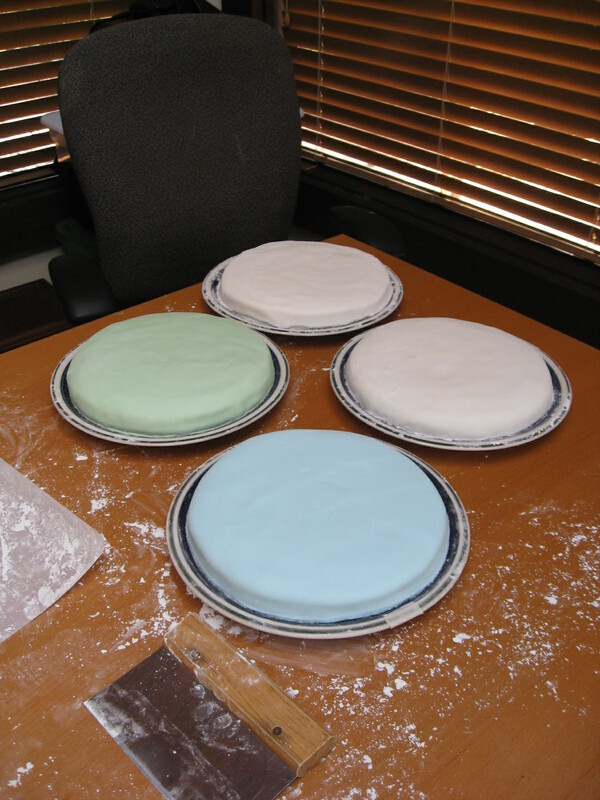 Before adding the fondant, we iced the cakes with buttercream and refrigerated them. 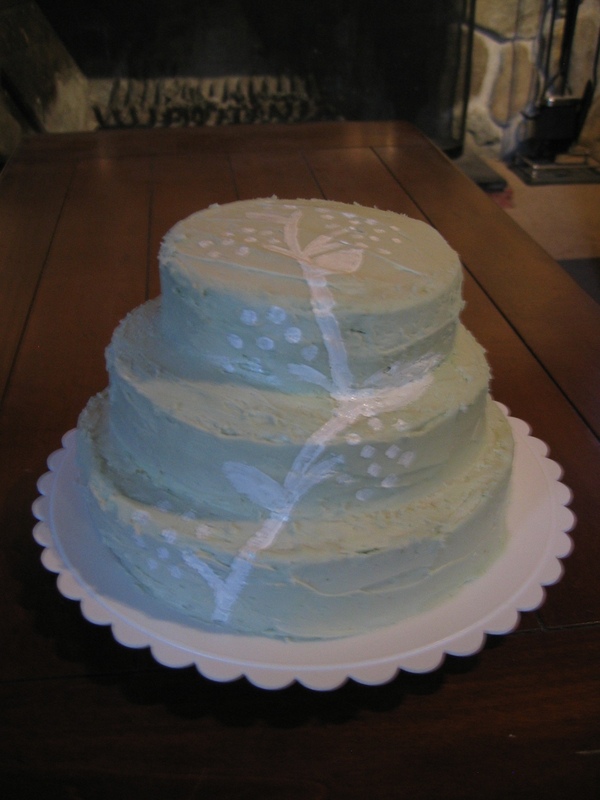 The icing acts as a glue to keep the cake crumbs in place, and the fondant stuck on top. This was expected to be the big problem step, but it was every easy. We made clear progress in our technique with just the four cakes. The white ones were done first, and the colored ones after. By the blue one, it was a smooth and even finish. We used marshmallow fondant, which was both easy to make and cheap. And it tastes much better than any of the “proper” fondant I’ve had on wedding cakes. Pretty cakes can be tasty, too! There will be a lot of test cakes in my future. Next I want to experiment more with fondant thickness and flavorings, as well as testing some more color options. I like the monochromatic look with white; I’d also like to see if I like it as well with pale colors. We didn’t get a chance to test painting on the fondant with the gel colorants, and I’ll probably get that into the next test batch, too. Obviously I’ll have to try tiers sometime, too, but I figure I’ll make more decoration decisions first since I have everything I need for that already. I’m so excited about this. It totally de-mistified fancy cakes. And I spent about $5 a cake for these, even including the equipment purchases that will be used for all the rest of the cakes I’ll make in the future. I doubt that the cost of all of my test cakes, plus the cake gear, will come out to even half of the cost of a bakery wedding cake. Plus it’s a heck of a lot of fun! I’m clearly not very good at this blogging thing. I’m sorry it’s been so long since I last posted, as well as never posting pictures. Matt and I are still healthy and happy, though both still unemployed. I had a brief, unfortunate experience with a company, but am much happier with no job than that job. The market around here is tough all of the time since it’s small and relatively far from any other towns, but right now with the economy and huge education cuts at the state level, it’s even worse. But, we’ll figure something out, and we’re not despondent yet. 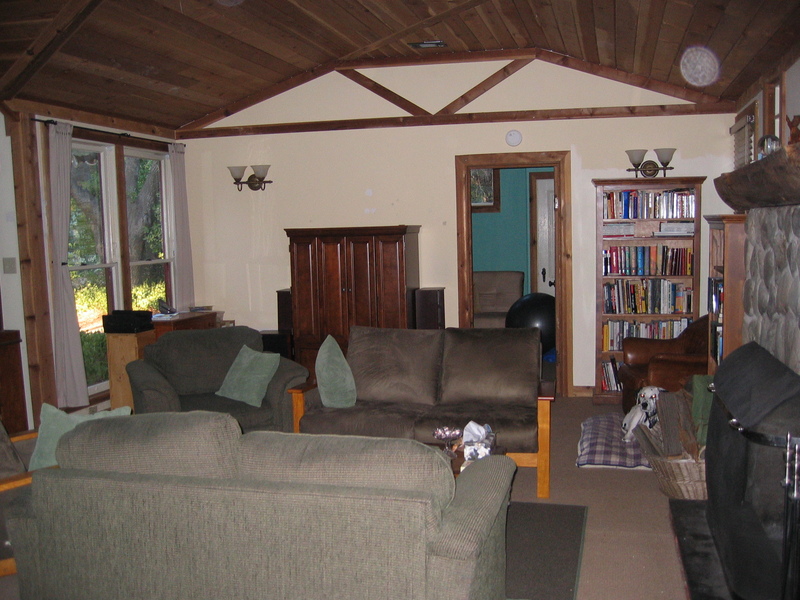 The house is mostly put together, but there are still some boxes in a few corners, mostly filled with work-related stuff or paperwork archives. 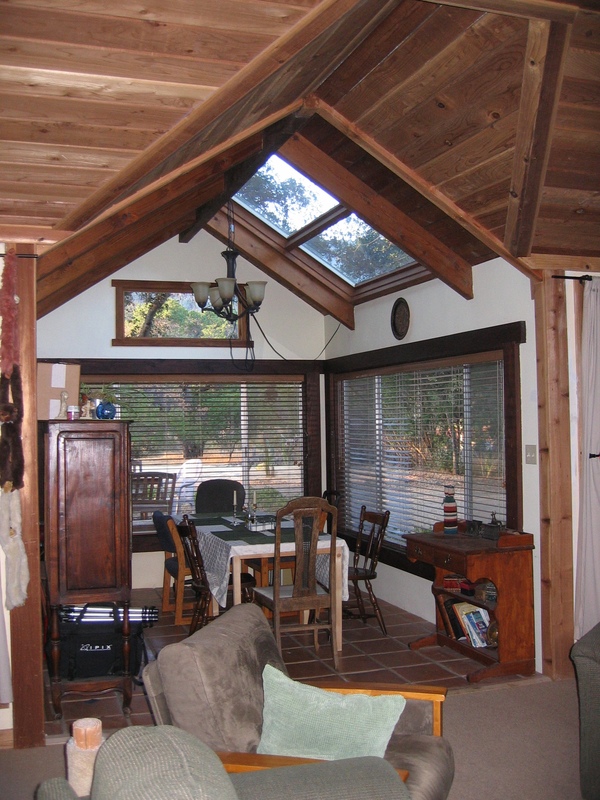 We completely re-did one room, the old porch area, and love it. 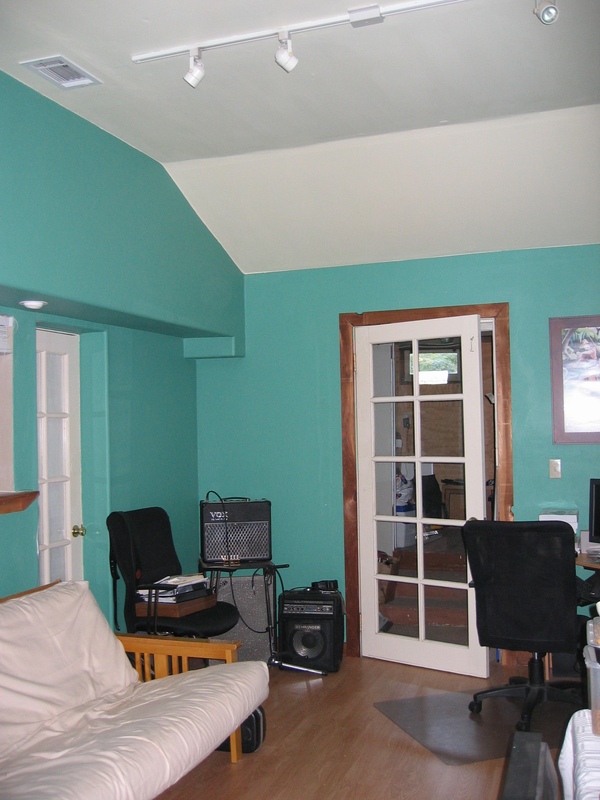 We leveled sub-floor, installed laminate flooring, painted, and reinstalled all the moulding after recutting it when necessary. Matt and our parents did most of the work since it was when I was working, but I helped, too! We’re also almost done painting everything. Next on my list is doing some path and trail maintenance outside, but I’ll need to work around the heat waves. Last week we had four days with temperatures over 110, though it still got down to under 50 degrees every night. I was not keen on the heat, but it’s not normal for it to be that hot, and we can always escape to town where it’s always cooler due to the ocean. We’ve had a steady stream of friends coming to visit, which has been great. It’s so nice to have a place where there’s both enough room for everyone. Plus the scenery seems to meet with everyone’s approval! We’re continuing to unpack and to figure out how things fit in the new place. We’re getting there. We still don’t have any shelving or dressers, so we can’t really get our clothes or books sorted yet. 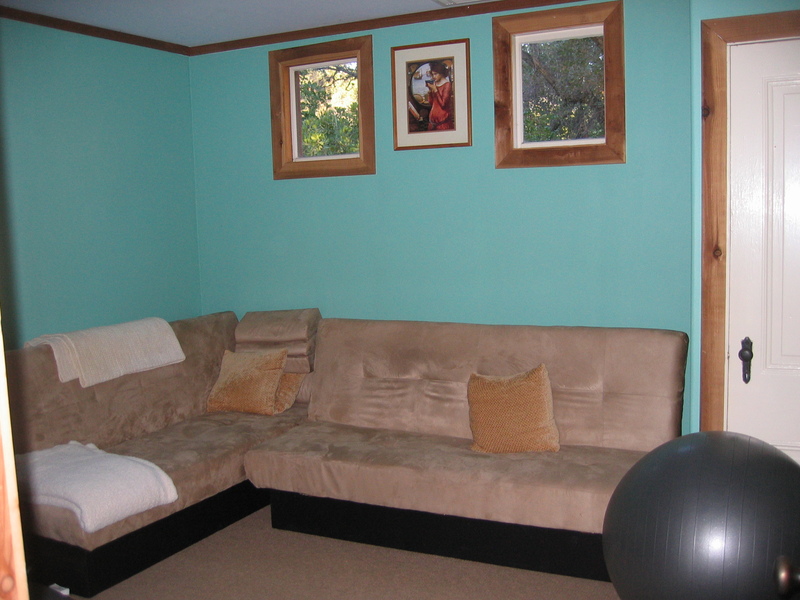 But we have comfortable couches and plenty of good food! I’ve been having a great time cooking. I was afraid that my yeast had died during the trip, but there was enough of it alive to rise well when I left the bowl in the sun. 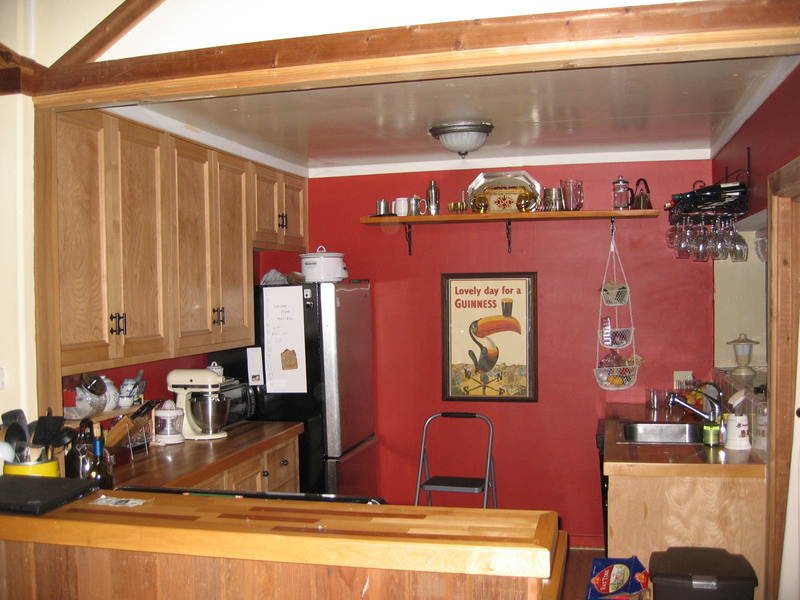 Having a whole house of “warm, draft-free” places is very convenient for breadmaking! I love doing errands on weekday afternoons. You can get so much more done when most people are at work! I keep looking around at everyone else and wondering how it is that they’re all not at work, too. What strange and exciting ways do they fund their middle-of-the-work-day shopping trips? If I could learn their ways, maybe I could keep this up! a day when I would be excited about dial-up again. Sigh. Amazingly, we have only found one, single thing that has been broken from the move, and that was some hardware on our disassembled entertainment center that was easy to replace with a trip to the hardware store. The entire kitchen made it 100% intact. I had decided on the road that I would assume that everything was in shards, and anything that made it would be a bonus. I was very pleasantly surprised!